By year end 2016, WMT expects mobile sales to be about 10% of digital commerce but mobile-influenced offline sales to be double digital commerce. Increasingly, the path-to-purchase goes through a smartphone – whether checkout is online, in-app, or in-store – fragmenting the current default choice of consumers of a visit to Amazon.com. In the emerging era of social commerce, retailers will not need to compete with Amazon.com for digital mind-share only through their own web-site; through “social commerce” they will be able to leverage platforms such as Facebook (particularly Instagram) and Pinterest with targeted and buy-button-enabled messages and to control fulfilment costs through promoting in-store pick-up. Micro-moments is a Google created concept that, at its core, is the moment that a consumer acts on a need – it can be the need to know, need to watch/listen or the need to buy. Practically, it is that moment that a consumer turns to their smartphone in order to learn about a product or brand and potentially starts down the path to purchase a product. Why do these micro-moments matter to retailers? According to a Google/Ipsos study, “Consumers in the Micro-Moment” (March 2015), 82% of smartphone users turn to their device in order to help them make a decision about a product. Having done so, 93% of people who use a mobile device for research go on to make a purchase (Google/Nielsen’s “Mobile Path to Purchase” study, November 2013). It is our view (Retail Tech: The New “App-and-Mortar” Era of Retailing) that, with shoppers armed equipped with smartphones as personal assistants, app and mortar retailers can substantially improve their competitive positioning versus Amazon (AMZN). The digital brands, through Google’s “micro-moments” and Amazon’s “dash” button, are looking to move to the pre-search phase of the path-to-purchase but app-n-mortar retailers have an important, albeit untapped, data advantage: 90% of commerce still occurs in stores. Once the micro-moment (need to know) leads the consumer to their smartphone and overwhelming toward “need to buy”, where is the purchase made? Based on comScore’s Local Search Study, 73% of consumers completed their purchase after a mobile search not online, but in a physical store. Smartphone users are increasingly using their device to influence a purchase decision while in a store, and we believe that app and mortar retailers will increasingly hold an advantage versus internet only retailers mobile commerce sales become a larger and larger percentage of total ecommerce sales. The challenge is that traditional in-store purchases do not generate useful data because the POS-scan is not associated with the personally-identifying information (PII) of the customer. This makes it difficult for retailers to achieve in-store the level of personalization that AMZN achieves (because, except for guest purchases, shoppers on Amazon.com log-on and hence give up their PII). App-n-mortar strategies look to address this by transforming retailer apps into personal assistants for in-store visits through two innovations: beacon technology (so that the app can provide useful navigation and messaging through a store visit) and mobile checkout (so that shoppers can integrate loyalty-redemption into the main payments stream). The consumer-benefit of these services will drive consumers to use retailer-apps during in-store visits, and hence reveal their identity making the associated transaction records available to personalize the experience on both mobile- and fixed- internet. In the meantime, phone-based sales are already growing at 50% annually (Chart 1) with mobile-only shoppers disproportionately represented in the mix for app-n-mortar retailers relative to AMZN; for example, over 50% of digital visitors to WMT and TGT are mobile-only versus less than 40% at AMZN. We view the prototype as WMT’s “Savings Catcher” program under which a consumer can earn a local price-match guarantee by entering receipt information into the WMT app (either through using the phone camera or through manual entry from a web-site); WMT then uses these data to customize the presentation of Walmart.com to that consumer. The need for a consumer to enter receipt information creates a friction so that fewer than 3% of WMT receipts participate in Savings Catcher, but we expect this to rise dramatically as WMT integrates payments into its app (through a pay-with-CurrentC button). On its face, AMZN is dominating e-commerce: in 2015Q3, for example, AMZN’s e-commerce sales in North America increased 28% versus 10% growth for WMT’s e-commerce sales off a much smaller base. A Reuters/Ipsos poll conducted earlier in November saw AMZN (51% of respondents) emerge as the clear winner when consumers were asked “What type of online store or website do you plan to do most of your holiday shopping this year?” Walmart.com (16%) was a distance third, outpaced by the “other” category. 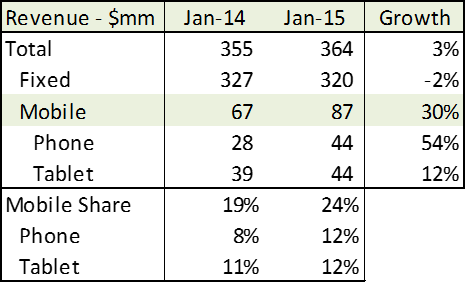 There doesn’t appear to be much doubt as to where current business momentum resides. However, digital revenues from smartphones at 50 retail sites tracked by Branding Brand grew even faster at over 50% and reflect a shift in consumer habits so that there is a meaningful shift in commerce from fixed- to mobile-internet (Chart 1). Furthermore, an important driver of this is consumers who have abandoned the desktop and shop only with phone or tablet. 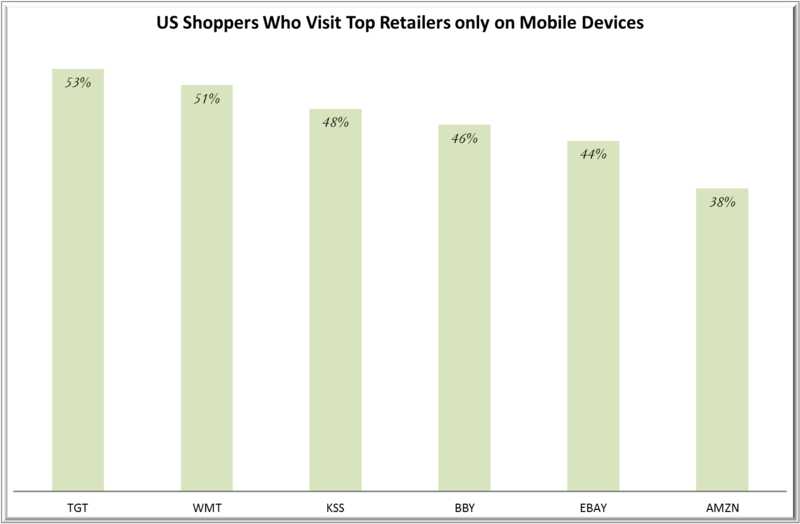 Unsurprisingly, these mobile-only consumers are more important to the digital businesses of app-n-mortar retailers than AMZN accounting for over 50% of digital visitors at WMT and TGT versus below 40% at AMZN (Chart 2). For the full-year 2015, we expect mobile commerce in the US to have grown at least as fast as the 40% reported for full-year 2014 as retailers have improved their apps for a better shopping and search experience, and for a more streamlined checkout process. According to Internet Retailer, mobile commerce sales will total 29.7% of all e-commerce sales in 2015, up from 24.6% in in 2014. 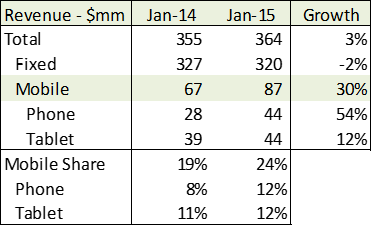 The 38.7% anticipated year on year growth is better than 2.5x the growth of overall e-commerce sales. 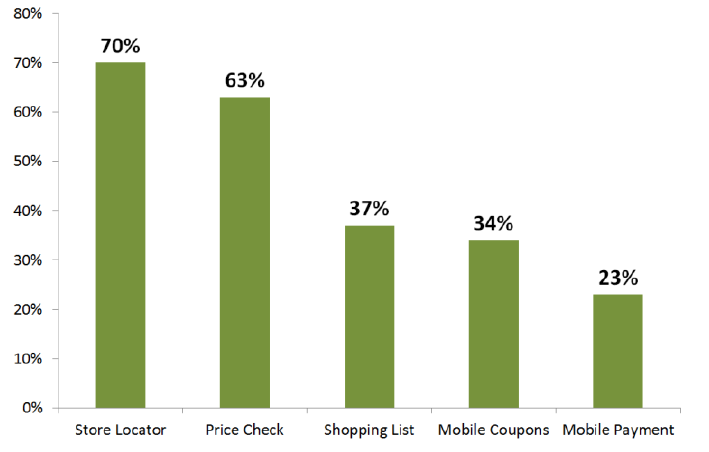 Clearly, mobile commerce sales is where the action is, even relative to fixed internet ecommerce sales. Beacons: Beacon-enablement will be the killer-feature for retailer apps since many shoppers already have phones in hand when they enter and navigate a store and already use the phone for a variety of shopping-related activities (Chart 3). This creates the opportunity for beacon technology to encourage nearby consumers to enter a store (proximity use-case), to offer a welcome message as a shopper enters the store and ready a pre-approved payment method for any purchase (check-in use-case), to market relevant sale items and offer coupons based on shopper profile and previous history (marketing use-case), to provide personalized location-based assistance and product information as shopper moves through the aisles (navigation and product-discovery use-cases). Beacon provider SWIRL reports engagement rates (as measure by consumers opening a pushed message triggered in-store by beacon interaction) of 60-70% compared to a 12% engagement rate for push messaging. Mobile Payments: Replacing a card-swipe with a phone-tap has disappointed: Phoenix Marketing reports that Apple Pay adoption was 14% of credit card customers with eligible iOS devices one-year after launch and representing a meaningful slowdown from the 11% consumer take-up 4 months after launch. The reason is the absence of a consumer value-proposition beyond the novelty of that first trial. Retailers are in a stronger position to drive the adoption of mobile payments because they, and only they, can integrate payments with the redemption of SKU-level coupons; indeed, this is the ground-breaking innovation behind the pay-and-save CurrentC app from the retailer payments consortium, MCX. This integration will transform retailing through improving the efficiency of trade-spend which, at $200bn annually in the US, dwarfs the $60bn amount available (through interchange) to fund traditional bankcard rewards programs. The promise to retailers of consumer use of smartphones is not that it improves narrowly on the payment interaction at point-of-sale but that it integrates payment with value-added services and, in particular, integrates the earning and redemption of loyalty points and coupons into the payments stream. These value-added services include convenience services (such as order-ahead and, in the case of WMT, in-store navigation), marketing services (such as loyalty programs and couponing), and authentication services (to capture the personally-identifying information of the customer for each transaction). As payments consultant Richard Crone comments: “the mobile wallet is a marketing platform, not just a wallet”. As the nexus of digital shopping shifts from desktop to smartphone, traffic will shift from browser to app allowing physical retailers to capitalize on their ability to combine the convenience of a digital shopping experience with the immediacy of a store experience. Gibu Thomas, SVP of digital and mobile at WMT, articulates the opportunity when he remarks “by 2016, e-commerce sales are projected to get to about $345bn in the US; ‘m-commerce’ sales – online sales through a mobile device – are projected to get to about 10% of that number. But if you look at mobile-influenced offline sales in that same time frame, they are projected to reach more than $700bn”. And, as traffic shifts to retailer apps, these retailers will capture the personally-identifying information from customers that visit their stores and feed that back to personalize the digital experience in just the same way that AMZN does now. Indeed, WMT is already moving in this direction, even though its app does not yet support payments, through the “Savings Catcher” program under which a consumer can earn a local price-match guarantee by entering receipt information into the WMT app (either through using the phone camera or through manual entry from a web-site); WMT then uses these data to customer the presentation of Walmart.com to that consumer. ©2015, SSR LLC, 1055 Washington Blvd, Stamford, CT 06901. All rights reserved. The information contained in this report has been obtained from sources believed to be reliable, and its accuracy and completeness is not guaranteed. No representation or warranty, express or implied, is made as to the fairness, accuracy, completeness or correctness of the information and opinions contained herein. The views and other information provided are subject to change without notice. This report is issued without regard to the specific investment objectives, financial situation or particular needs of any specific recipient and is not construed as a solicitation or an offer to buy or sell any securities or related financial instruments. Past performance is not necessarily a guide to future results.